Despite having surmounted numerous obstacles, the Affordable Care Act—also commonly known as "Obamacare"—remains highly controversial and faces ongoing legal and political challenges. The law's staunchest critics want to repeal and replace the entire law, while even its supporters acknowledge that serious changes are needed. The question is: replace it with what? 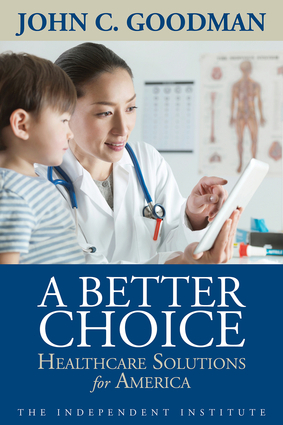 In A Better Choice: Healthcare Solutions for America, economist and John C. Goodman answers the question clearly and concisely. For anyone who wants to better understand Obamacare's most serious problems and learn about some of the boldest prescriptions designed to remedy them, Goodman's book is a must-read. John C. Goodman is Senior Fellow at the Independent Institute, President of the Goodman Institute for Public Policy Research, and author of the widely acclaimed, and the award-winning Independent book, Priceless: Curing the Healthcare Crisis. The Wall Street Journal and the National Journal, among other media, have called him the "Father of Health Savings Accounts." Dr. Goodman is frequently invited to testify before Congress on health care reform, and he is the author of more than fifty studies on health policy, retirement reform and tax issues plus ten books, including Living with Obamacare: A Consumer's Guide; Lives at Risk: Single Payer National Health Insurance Around the World (with Gerald Musgrave and Devon Herrick); Leaving Women Behind: Modern Families, Outdated Laws (with Kimberley A. Strassel and Celeste Colgan); and the trailblazing Patient Power: Solving America's Health Care Crisis, that sold more than 300,000 copies. His other books include The Handbook on State Health Care Reform, National Health Care in Great Britain: Lessons for the U.S.A., Economics of Public Policy: The Micro View (with Edwin Dolan), Fighting the War of Ideas in Latin America, and Privatization. Dr. Goodman received his Ph.D. in economics from Columbia University, he has been President and Kellye Wright Fellow in Health Care at the National Center for Policy Analysis, and he has taught and completed research at Columbia University, Stanford University, Dartmouth College, Southern Methodist University and the University of Dallas. In 1988, he received the prestigious Duncan Black Award for the best scholarly article on public choice economics. He regularly appears on television and radio news programs, including those on Fox News Channel, CNN, PBS, Fox Business Network and CNBC, and his articles appear in The Wall Street Journal, Investor's Business Daily, USA Today, Forbes, National Review, Health Affairs, Kaiser Health News and other national publications. Dr. Goodman was also the pivotal lead expert in the grassroots public policy campaign, "Free Our Health Care Now," an unsurpassed national education effort to communicate patient-centered alternatives to a government-run health care system. The initiative resulted in the largest online petition ever delivered on Capitol Hill.